The 2 star budget Hotel Sallustio Rome enjoys a central location near Termini and Porta Pia, giving our guests maximum convenience for exploring the city. 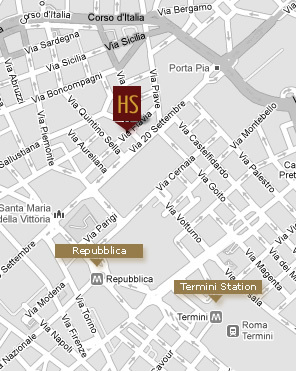 The excellent central location of the Hotel Sallustio Rome means that guests have the eternal city on the doorstep. The historical centre is several kilometres wide (there is a lot of history after all) and our cheap 2 star hotel in Rome is on the eastern edge of it, meaning that some of the world’s most famous historical wonders, such as the Colosseum, the Pantheon, the Spanish Steps and even the great St Peter’s Basilica are within walking distance. Our low cost 2 star city centre hotel near Termini Station offer great value for money accommodation in the heart of Rome’s historical centre to those travellers on a low budget, families and guests who simply care about seeing the city rather than the swimming pool. Family run and offering simple, clean and secure rooms, our value hotel in the centre of Rome is a great upgrade from a 2 star hotel or hostel and features a host of home comforts which allow you to relax with peace of mind. Our proximity to the city’s main train station also makes us extremely easy to find on arrival and throughout the duration of your stay!